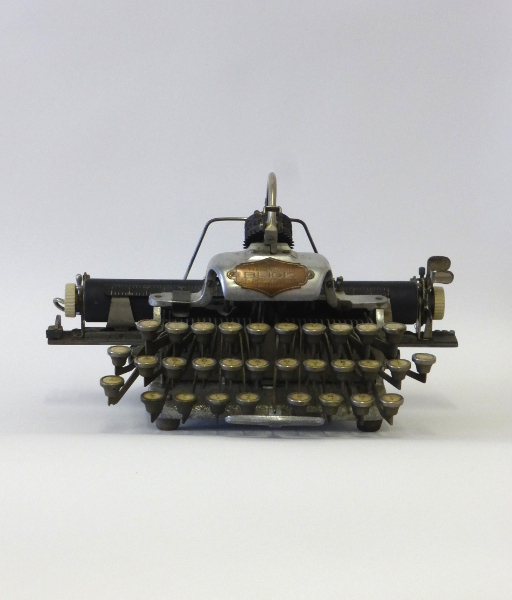 The Blickensderfer Typewriter Company began to make their model 5 even lighter by making it out of aluminium instead of cast iron. The relatively new aluminium casting technology delayed production of these machines until 1901, way after the Blickensderfer models 7 and 8 were already being produced. Production of these aluminium model 5s was low until the second-half of 1909 when production increased. But by mid-1910, production of the aluminium model 5 essentially ceased and production of the Aluminium Featherweight Blick and Blickensderfer No. 6 continued. By 1914, the aluminium model 6 was nearly phased out. After WWI, only 800 Featherweights were manufactured and many of these machines were sold in Europe, especially in Great Britain. Loaned to Smart Gallery by Andrew Wilson.